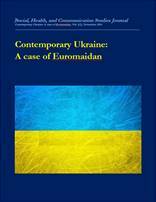 The Euromaidan shocked most observers of Ukrainian politics, not only for its longevity (November 21, 2013 – February 22, 2014), but also for its turn to violent repertoires of protest in the later stages. What was at first a peaceful mass protest event which saw nearly equal participation of men and women (Onuch, 2014d; Onuch & Martsenyuk, 2013), turned into what seemed to be a violent and male dominated riot. While much attention has been paid to the brave ‘women of the Euromaidan’ who also engaged in violent protests (Khromeychuk, 2014; Phillips, 2014), female activists and other protest participants (‘ordinary’ citizens) have reported a gendered division of labour in the protest zone. Thus, it is still not clear what the role of gender was during the different stages of protest - and if the participation of women was in fact, any different from that of male protest participants. This paper employs original data from rapid interviews and onsite surveys of protest participants, and the authors’ in-depth interviews with 48 activists to investigate how violent repertoires and the general militarization of the Euromaidan protests reproduced patriarchal gender stereotypes. Dr. Olga Onuch (DPhil, Oxford) is a Senior Lecturer in Politics (University of Manchester) and an Associate Fellow in Politics at Nuffield College, (University of Oxford). Previously she was a Research Fellow at Harvard University and was awarded the Newton and Leverhulme Early Career Fellowships. Dr. Onuch’s comparative study of protest politics, political behaviour and institutions in democratizing states in Latin American and Eastern Europe has made her a leading expert in Ukrainian and Argentine politics. She has recently consulted policy makers in Canada, the UK and US on the 2014 Ukrainian Crisis and has published policy papers, academic articles, and books on these topics. Her research has appeared in the Washington Post, The Times, BBC, ITV, Al Jazeera, AFP, among others. Her book “Mapping Mass Mobilizations” (2014), explores mass protest in Ukraine (2004) and Argentina (2001). Dr. Tamara Martsenyuk holds a PhD in Sociology and her research interest focuses on the social structure of society and, particularly, on gender relations. She is Associate Professor at the Department of Sociology, National University of “Kyiv-Mohyla Academy” (Ukraine) and DAAD Visiting Professor and Scholar at the European University of Viadrina (Germany). She is the author of around 40 academic publications, chapters of textbooks and chapters of books (Gender, Politics and Society in Ukraine, published in Toronto University Press in 2012). Tamara’s latest research is connected with women’s and LGBT activism in Ukraine, particularly on Euromaidan protests 2013-2014.